“Dilli Hai Dil Walon Ki” has been always filled with the fragrance of love and romance. The aroma of love can be felt across the everyone corner of Delhi. In spite being one of very historical city in India it has been always confusing to chose a right picnic place to hangout with friend, family or take college and school students. We all are aware that India is a country known for it’s cultures and traditions. There are places that reflect all the specialties of India where you would not only be getting a chance for exploration but also enjoying its silence and royalty. Kingdom Of Dreams is located in Gurgaon Sec-29 in Delhi & NCR region. It is India’s first live entertainment theater comprising numerous Live Shows that is enjoyed by every age. Kingdom Of Dreams mainly consist of two theaters Nautanki Mahal and Showshaa theater accompanied by a cultural and cuisine area-Culture Gully. As the name suggests this place definitely brings dreams alive. Shows like Jhumroo and Zangoora are a hit here. The fact that at night the place is illuminated and surrounding with lighting makes it more beautiful and elegant to admire. This place indeed deserves a place in the list. Pratapgarh farm is an exotic location within Delhi NCR in Jhajjar district. If you want a day out from the fuss and hustle of the city this place should be the first choice.This place is suited for everyone from youngster to oldies,from children to parents and form individuals to groups/couples.If you intend to spend your day with fun and excitement engage yourself with different activities provided by the place and make it memorable.The resort offers you number’s of activities some of which includes-Burma Bridge, Valley Crossing, Camel and Bullock Cart Riding, Tractor Rides, Night Walks along with the exquisite and delicious taste of the cultural food. Note:-children below 5 years will be complimentary. 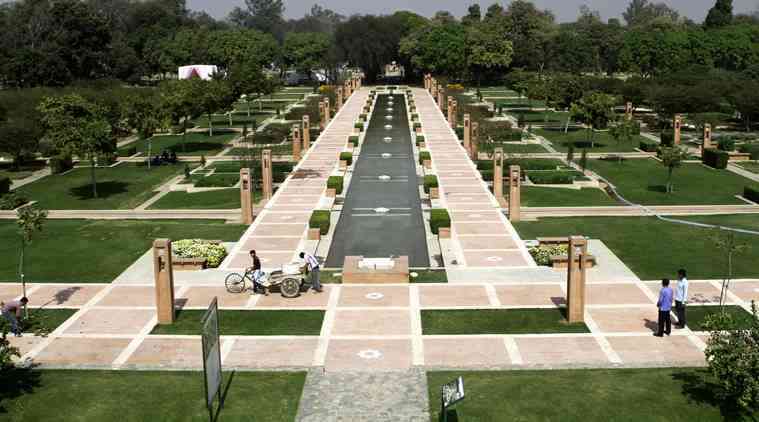 Children’s Park is located near India Gate and is mostly suitable to children’s along with some guidance. This park offers children’s a variety of swings and the elders a great place to explore with the huge lawn and beautiful landscape. Especially created as per the view of kids this park offers them everything they need to get theirselves entertained the whole time.Add on to the swings and garden, an Aquarium and a Musical Fountain is also situated within the park keeping in mind the needs of adults. Note:-All entries are free of cost. Adventure Island is a theme based amusement park located in Rohini. It is most famous for its adjacent Mall named Metro Walk. If doing something adventurous and experiencing something insanely mad this is surely the best place for you. With its rides, boating and rain dance floor this place suits for mostly to adults as well as children. Take a day out of your schedule and visit Adventure Island to add some refreshment and relaxation to your monotonous life. Fun N Food Village (Fun and Food Village) is located at Gurgaon Road in Kapshera . Just like Adventure Island it is a adventure park despite of the mall. It is a Simple yet entertaining park particularly for school students or young adults but can be joined by families too. Here people are mostly seen enjoying the water rides due to which a huge crowd is always seen on the cue. Other than the water rides a no of other rides are also present in the premises along with rain dance platform. National Zoological Park or mostly known as Zoo and Delhi Zoo is located in Mathura Road, New Delhi near Purana Quila. Many of us have already visited the place quite a few times since childhood and are still adoring the place from the heart.Zoo is considered to be one of the most interesting picnic spot that can be enjoyed with family. Zoo has been sheltering more than 1200 reptiles, mammals and birds belonging to different countries. Qutub Minar is located at Mehrauli. Qutub Minar was built by Qutub-Ud-Din-Aibak in 1193. It is widely famous for its 73 metre high tower thus considered as the highest tower in India. Along with the Minar there is a open wide ground best used as picnic spot. The ground is big enough to fit up a crowd. This is enjoyable for playing purposes people are usually seen here playing different kind of sports only because of the vast and open ground. India Gate is located opposite to the Rajpath. India Gate was made in the memory of the soldiers who lost their lives during first world war. The history of the place makes it even more beautiful and dear to heart. India Gate is known as the best place to hangout with friends or family.During night time the place gets more crowded and noticeable. The big and wide lush green ground is loved by everyone. This place is often used as a Birthday party or casual get together medium. Note:- Entries are free of cost. Red Fort is located in Netaji Subash Marg, Chandni Chowk. Although it is a historical place but this fact doesn’t limit it from being a tourist attraction. People from different countries can be seen here exploring this heavenly place. The fort is clean,simple and royal. Those who haven’t seen it yet have missed surely missed whole chapter from their book. The amazing architecture and pretty gardens are eye catching. Jantar Mantar is mainly located in Connaught Place (CP). Jantar Mantar was built in 1724 by Maharaja Jai Singh. However there is not much to see still a lot to experience. The open and crowded spaces makes the place more noticeable once entered. If you wish to refresh your mind for an hour this place definitely fits in the list. Mostly family or group of friends are found here chit-chatting or just wandering during the process of observing the place better.